Spring is the season when a lot goes on in Chicago theater and other performing arts. (It’s still not as stuffed with events as October, however.) This is part 1 of two posts this week. Certainly my favorite theater experience was seeing my 16-year-old grandson perform in his high school’s production of Urinetown yesterday. I’ve seen that play so many times I could recite parts of it by heart. But it’s a smart play and the production was really good. The kid did an excellent job, playing three different parts and successfully mastering the quick offstage costume changes required. The last performance was Saturday night, so I won’t recommend you check it out. Urinetown was written by Greg Kotis (of Chicago’s Neo-Futurists) and Mark Hollmann and opened on Broadway in September 2001; I saw it there a couple of months later. The premise of Urinetown does make you think. It’s set in a period of economic decline and extreme water shortage. If we can privatize highways, bus shelters and parking meters, can “public amenities” be far off? I hope Mayor Emanuel has not seen this play. Step Up Productions is staging this brave play that treats domestic abuse as part of its mission to benefit a local nonprofit for each production. Darlin’ deals with Clementine, a woman who leaves husband, home and children and moves into an anonymous motel room, where she meets an assortment of down-on-their-luck souls. One of them is a motel maid who blames her injuries on a box of Brillo pads falling on her from a high shelf. She and Clementine share some strong scenes. The theater will donate a portion of its proceeds to the House of the Good Shepherd, which serves women and children survivors of domestic violence. 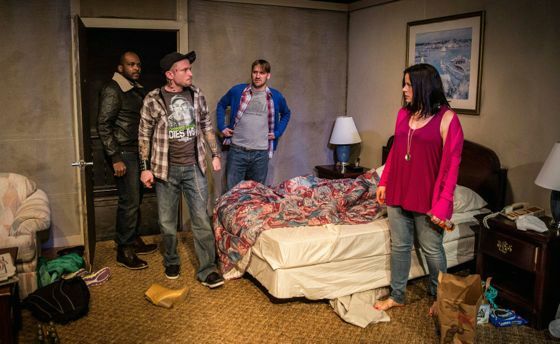 Last fall’s production, The Benchmark, benefited the Chicago Alliance to End Homelessness. The Hypocrites move to the Mercury Theatre on Southport to stage their version of the Sondheim musical, based on classic fairy tale characters. The play is a 1987 show by Stephen Sondheim and James Lapine. Since I have often admitted I hate musicals, you know I’m going into this one with my cynic’s pen in hand. But I do like Sondheim’s music and the lyrics are often thought-provoking. This show is performed by 10 talented actors and singers and it has received mixed reviews. The setting is designed like a children’s park, suggesting “the playground of a top-notch arts magnet school,” as one reviewer commented. 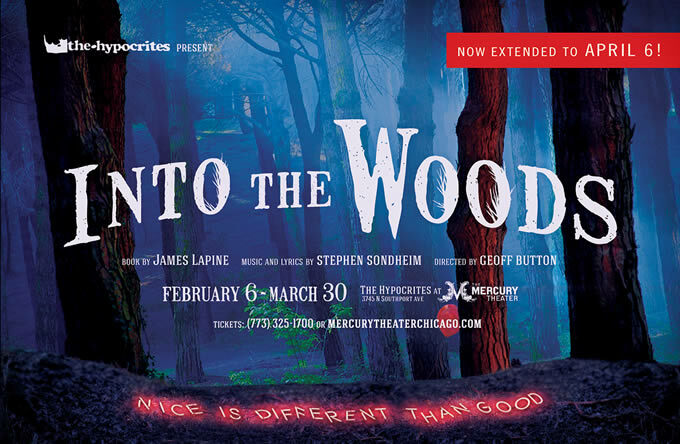 To me, the “into the woods” theme has a dark overtone, and some of the lyrics portend danger. But when the trees are represented by balloons, it’s a clever touch but loses the darkness. I kept wondering if they were going to pop all the balloons to mimic leaves falling off trees. It would be a Hypocrites kind of symbolism. The Hypocrites do a decent job of this, although I would argue with some of their costume and stage setting choices. The show runs through next weekend, so if you’re a Sondheim fan, you will want to see it. If you’re going to see one film this week, make it this new Wes Anderson charmer. On the surface, it’s the reminiscences of the owner of the now somewhat rundown hotel in the fictional central European country of Dubrowka. He tells of his adventures as a lobby boy for Gustave H, a concierge of multifarious talents, played by Ralph Fiennes. I think of Fiennes as a serious actor and I have admired his work in many classic roles, on stage and film. But here he shows he can be a comic actor of the highest caliber. 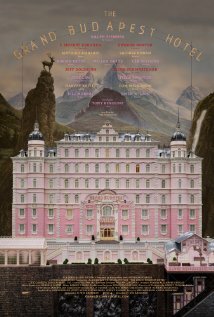 The film has an amazing cast including short but inspired performances by Adrien Brody, Bill Murray, Willem Dafoe, Jeff Goldblum, Owen Wilson, Jude Law and many others. There are too many convolutions, escapes and chase scenes to describe here. And pastry. Lots of pastry. The brilliant thing about this film is that it is a panoply of film history and film techniques. Not only is there beautiful cinematography, there are models and stop-motion animation. And to show time changes, the color palette and aspect ratio of the film changes from widescreen to traditional boxy shape and back again. Whimsical? Quirky? Idiosyncratic? Nostalgic? Yes, it’s all of those. And on top of the humor and whimsy, there’s a hint of the World War II tragedy to come as German military officers accost Gustave and the lobby boy on a train. This phrase appears twice in the film: “a glimmer of civilization in the barbaric slaughterhouse we know as humanity.” I think Anderson wants us to remember it.